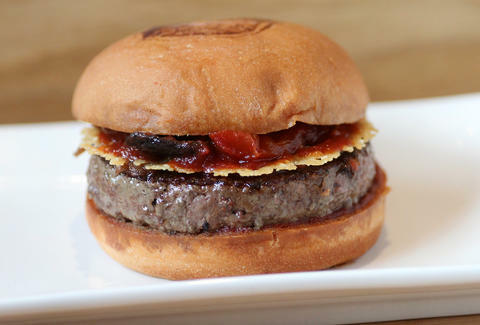 LA-based burger-world-conquering chain Umami Burger has just arrived in Chicago via Milwaukee Ave, and along with it, a menu that plays to the tongue's fifth taste known as "umami," aka the Japanese term for "savory meatiness," aka "whoa, this makes the burger taste phenomenal." 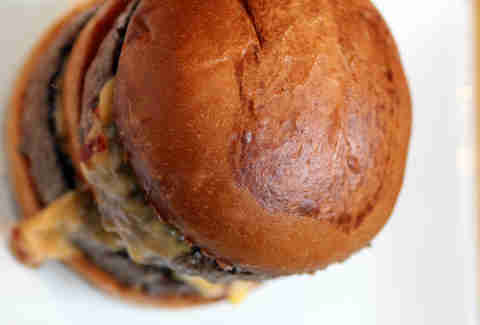 What makes a burger Umami? 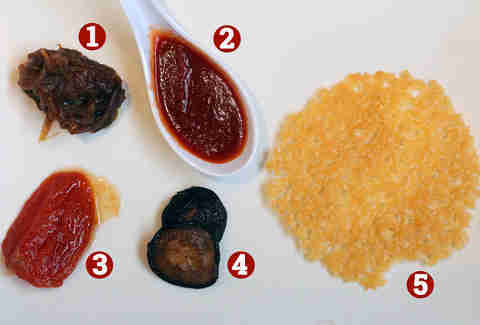 Roll over our handy heatmap above for a sample of toppings that rate high on the umami scale. 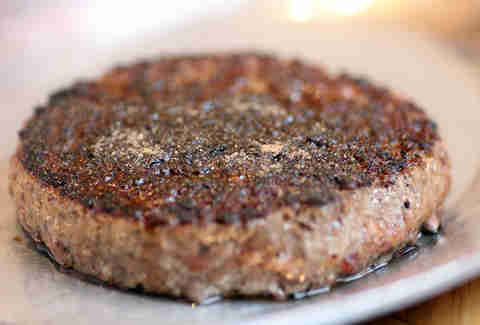 OK, now back to the burger: each patty is seared, topped with special Umami seasoning, and cooked to medium rare, since they're meant to be consumed on the spot (which you were planning to do anyway so... win-win!). 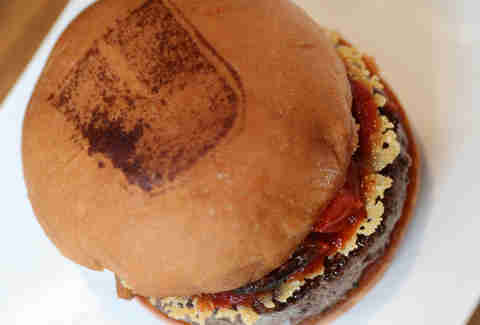 The toasted Portuguese-style bun provides the proper meat-to-bread ratio and features a branded "U" on top, as seen on the classic Umami burger. 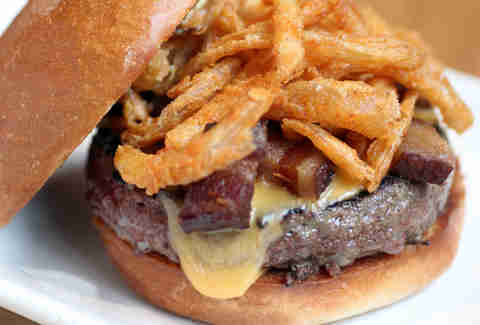 The Manly Burger (as if eating a burger was ever not manly) goes the extra man-yard with beer-cheddar, bacon lardons, and smoke-salt onion strings. 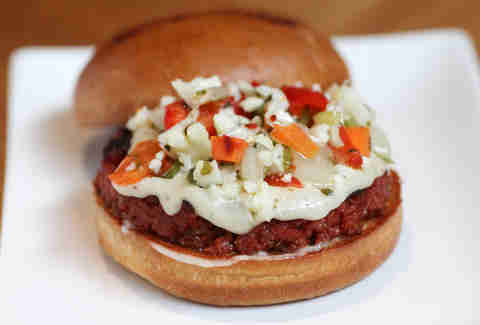 Exclusive to the Chicago shop, this Calabrese Burger digs into the city's love of sausage with a calabrese sausage patty, fondued truffle cheese, and house-pickled giardiniera. The B.U.B. (Big Umami Burger) takes the structure of a Big Mac to the next level with two patties, bacon, beer-cheddar, minced onions, and pickles. 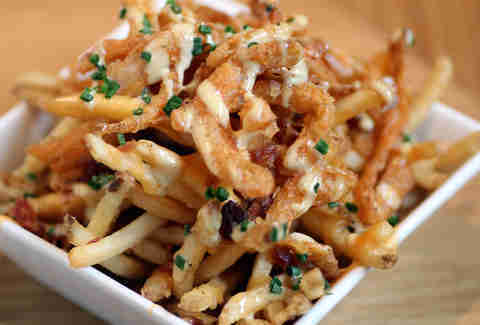 Sides include fries topped with your choice of truffle cheese, bacon and mustard, or a sloppy veggie mix. 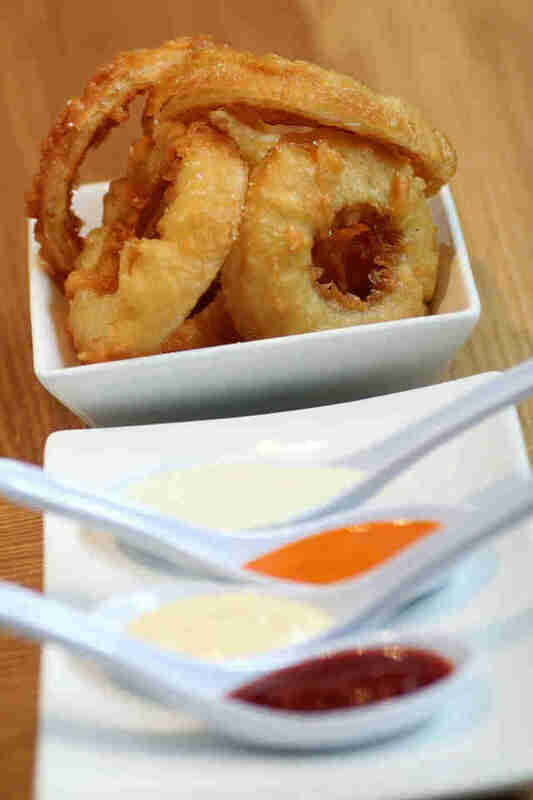 There are also tempura battered onion rings, four dipping sauces (garlic aioli, jalapeño ranch, El Diablo, and house ketchup), and an off-menu item that you need to commit to memory: the cheesy tots, packed with aged Parmesan and cheddar. 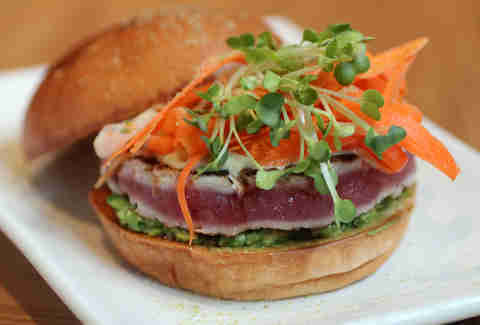 The Un-Beef section of the menu provides viable cow alternatives like the sushi-grade ahi tuna burger with daikon sprouts, crushed avocado, gingered carrots, and wasabi flakes. 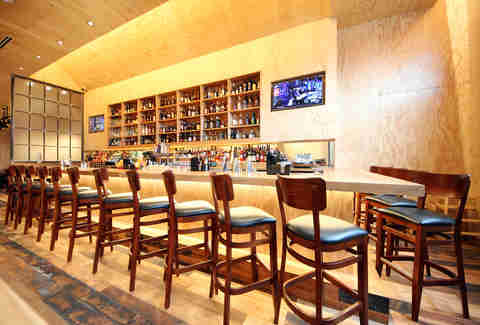 Oh right, and they've got booze, too: the plywood, street art-tagged interior houses a full bar with a whiskey wall that goes 70 varieties deep, plus 20 beers on draft or in bottles. 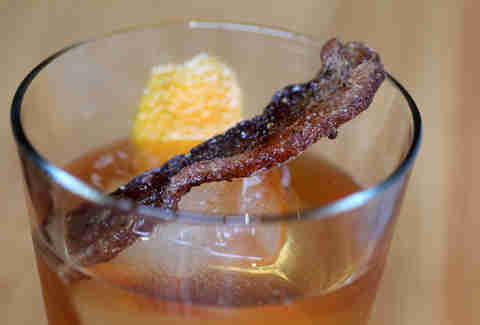 The maple bacon Old Fashioned serves as Umami's love letter to Chicago. 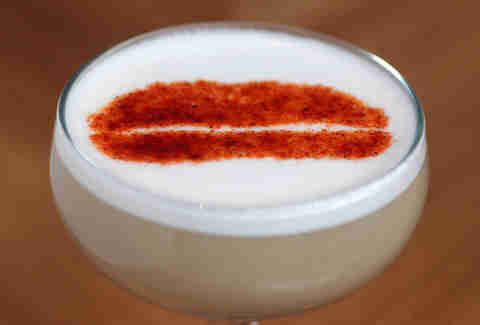 While the My Sour (bourbon, apricot liqueur, lemon, egg white) comes with a sprayed-on cayenne pepper burger logo. 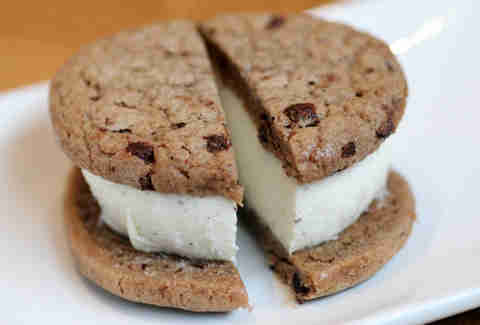 Keeping everything in handheld form, dessert offers a spread of four ice cream sandwiches with ice cream/cookie combos like vanilla bean/chocolate chip, salted caramel/snickerdoodle, and peanut butter/double chocolate chip.